September already..? It feels like it was only yesterday that the new year began. On another note though, it's technically Autumn now which is my favourite season ever! I love it when it starts to get colder, so I have every excuse to whip the big jumpers and cosy socks out! Anyway, I was originally hoping to do a favourites last month, but turns out I have had so much to do that when I eventually do have time to sit down and post, my body is too exhausted to even think! Once again, I'm late to the party, but I've saved why I've haven't been blogging as much for a separate post. I hope you can forgive me! So I thought I'd roll 2 months into one, as I would hate to miss out any must haves from July! I love this stuff! It is honestly one of my favourite things to remove make up and lazily cleanse my face with. Yep, I do fall into that habit quite a lot.. Still better than face wipes though, right? I love that 1 or 2 cotton pads remove all my make-up and cleanse my face at the same time, all without needing to rinse anything off afterwards. I have such an erratic skin type, which means I really struggle to find any decent skin care products which don't make my T-Zone blow up in oil after 5 minutes. This keeps it at bay and certainly works a treat! It doesn't irritate your eyes either, which is a huge bonus because there's nothing I hate more than rubbish eye make up removers which send you partially blind for a while. Needless to say, this doesn't do that or sting your eyes. I hope they never discontinue this because it's so affordable and you can get up to 200 uses out of it. As this has lasted me such a long time, I'd just like to point out that they have changed their packaging slightly so I've linked above to the new one! Some of you may be aware that I recently got balayage hair. This was a pretty big thing for me as I've never really been THAT daring with my hair. For those of you who don't know what balayage is, it's just a more random, gradual version of ombre/ dip dye. I had to have this done in 2 processes because my hair has so much build up of colour on the ends, the bleach struggled to take the first time around. This resulted in me having a lot of brass/copper tones to my hair. I was expecting this to happen anyway, as where I'd previously died my hair red, my ends went very orange where they had faded out over time! This is a purple shampoo (yes, it is literally purple) If you've never heard of it before it basically takes out copper tones to your hair, so if the blonde went slightly orange, it will gradually fade that out to a more ash blonde. Rejoice! I'm really getting along with it at the moment and noticing a difference each time I wash my hair. I definitely recommend this to anyone with similar dilemmas, it's worked wonders so far! I already own the Zoella 'Blissful Mistful' Body Mist and it's such a great smell, but the new Tutti Frutti scent really blew my socks off! I have been reaching for body mists a lot more in the last few months, as they are much more subtle than perfume, and a lot more suitable for me to wear on a daily basis. I've said before I don't always want to waste perfume if it's not a special occasion, especially when you can use a much cheaper alternative. You know me, love a good bargain! I love the whole Zoella Beauty range as it's so affordable and any scent lovers dream! I have worn this every day since buying it and I don't intend to stop anytime soon! You did good, Zoe! I purchased this not too long ago, after reading numerous good reviews on it. I did actually write about this in my most recent drugstore haul, which you can find here! I wasn't keen on the consistency to start with, as it was quite wet but the more I've used it, the better it has become. It really does hook and curl your lashes, and the more you build the better volume & false lash effect you have. It's perfect for your bottom lashes, as the shape of the brush picks them up and effortlessly coats them. Another great thing about the applicator is it's not too big, so it's easier to avoid your getting blobs of mascara on your skin. I will definitely be re-buying this gem! Dark under eye circles? No problem! One day a few months back, I decided I was fed up of looking constantly dull and tired, so I turned to my local Benefit counter. I've always known Benefit as a trusty brand, so I was willing to pay a little bit more than my normal £4.19 (specific I know) for a concealer! When I got chatting to one of the lovely girls, she recommended this. I can tell you now, she was not wrong. I thought I'd really struggle to get along with the fact this is a paste concealer, but honestly, I have been completely converted! Not only does this hide any dark imperfections, you can use it on spots or blemishes too. The packaging is perfect because it's so compact, meaning I don't struggle to fit this in my make-up bag. Now I know what you're thinking, it's so small? Surely that won't last 5 minutes? Wrong! A little bit goes a long way, considering I got this back at the start of the year, it looks pretty much untouched! Needless to say, I no longer suffer with dark circles and it really brightens up my face when I wear it! Absolutely worth the money and I love love love it! I really wasn't sure on this brush when I first got it. I couldn't get used to the fact it was so big and virtually poked me in the eye whenever I tried to apply foundation. This also isn't very dense, unlike my Real Techniques brushes, so I was finding myself pinching the hairs to save my foundation from slipping down into the brush! This aside though, I have really grown to love it! I find it effortlessly blends my foundation onto my face and leaves a really nice, subtle coverage! It takes me half the time it would if I used my RT Expert Face Brush, which is great because me being me, always in a rush- it's a great quick fix! I wouldn't limit this brush to just foundation, I'd say it's easy to pinch into a different shape for a bit of rough contour or even blush if you fancy it! Maybe it's not for everyone, but I definitely love it! I've come to realise, that I haven't actually done a product review in AGES. 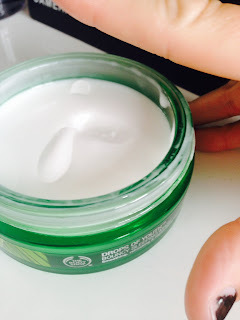 I've been in love with The Body Shop products for as far as I can remember, so what better than for me to review something in one of their newer ranges. The fondest memory I have growing up, is going round the whole shop and smelling every single soap/smellable product there was available to my senses. To be honest, I still do the same now! Bouncy Sleeping Mask comes with a tiny little spatula, as you only need a small bit on your face for maximum coverage. Scoop a small bit out onto your hand, warm it up around your palms, then massage in and around the face - just like you would with a moisturiser. The consistency is quite thick, so you don't need a lot upon application. The only thing I will say is that after you've applied the mask, it does leave your face feeling a little bit sticky until it's fully absorbed into the skin. Just a small price to pay for having glowing looking skin the next day! I like that less is more with this product, because at a price of £22 - I wanted make sure I was getting my monies worth. For something I'd never delved into before, it is definitely worth it. One of the main reasons is that I've had this for 3 months and it looks virtually untouched! Plus it works a treat for my complexion! This product is enriched with Edelweisss Stem Cells, which is new and upcoming ingredient, used for slowing down the ageing process and smooth out any lines. I mean, I know I don't really need to worry about wrinkles only being 21, but I do get a lot of unwanted lines on my face so I thought this would be perfect to try. Now, I was very intrigued by the word bouncy. I thought it was just a word to make the product sound more appealing, but no word of a lie, it actually is! 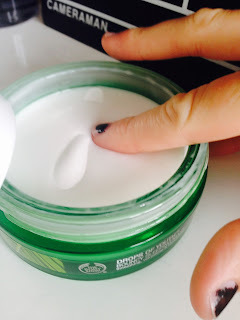 You press your finger into the pot and it just bounces back with little, to no product residue at all - you can imagine the effect it has on your face! 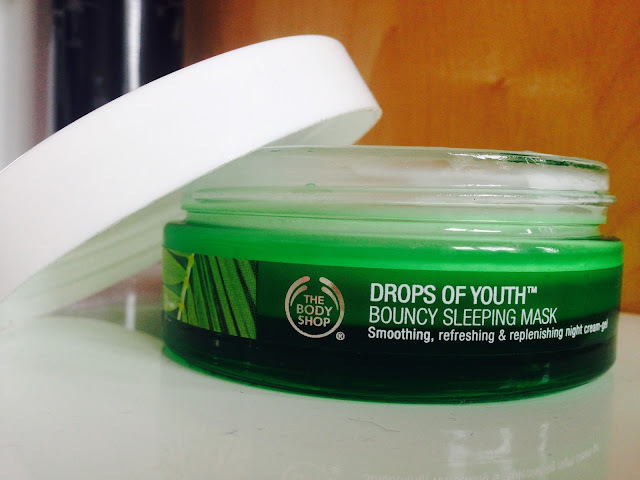 This can be used on any skin type, especially sensitive skin, as it locks in all the moisture your face needs and works really well whilst you sleep. Make sure you apply it at the very end of your skin care routine, that way it gives it the full effect. When you wake up the next day, your skin feels hydrated, awake and so silky smooth! This has a very subtle, yet overly satisfying smell. It's not too harsh or sweet, it's just very energizing and clean. The packaging is gorgeous, as it sits in a lovely green pot - anything that looks like this is almost guaranteed to smell super refreshing! So once again, The Body Shop have not let me down. I thought I'd share my opinions with you on this, just incase any of you were thinking about buying it, or looking for something new to try. Stating the obvious, but as you can probably tell.. I love perfume! Who doesn't?! It's amazing how powerful one smell can bring back so much nostalgia of a place or person. I feel like each smell has a different story to tell. Does anyone else get that? I like to wear it more on special occasions, or when I'm feeling my best, that way it makes more of an impression to the people around you. Let's face it, who wants to waste a spritz or two on a cba day?! I also think there's nothing better when someone walks into a room and their perfume hits you instantly. If I was ever a fairytale character, I'd be a person who collects nice smells in cute miniature bottles. Those you would expect to see on Alice In Wonderland! Here's what scents I have been loving throughout this and last summer! This has to be the most sophisticated looking and smelling perfume that I own. Although they say Eau De Toilette isn't as strong as a regular perfume, I find this lasts a fairly long time. The smell is quite intense, but not too overwhelming. It's very musky with orange and floral tones. I feel like if you're looking for something that makes a statement, then this is the one for you. Okay, maybe I'm cheating. This isn't a perfume as such, but the bottle just looks so lovely in my collection! I reach for it so much, especially when I want quite a subtle smell to wear out. This is the one I wear most to work, because I don't want to stand out too much, but I do want to smell nice & fresh. I recently wrote more about this in my 'May Favourites' post which you can find here! This has to be my go-to summer scent. The Marc Jacobs bottles are always the most creative ones to look at on the shelves, because they are so eye catching. I find the bigger the bottles get, the cuter the packaging! 'Dot' has to be my favourite of the range because of it's bold design, and delicious scent! The smell is very girly, which can only be described as it's floral, yet sweet! My main memory of wearing this is going on holiday to Tenerife with my boyfriend, and spending lots of summer days out with him. Unfortunately, this has been quite a rarity for the last year. Thnx 4 The Mmmrs though, Marc. There is absolutely no doubt that Avon perfumes are my guilty pleasure. There's nothing I enjoy more than endlessly flicking through the book when it lands on the doormat. I mean, who doesn't love a good perfume scented page? ;) I swear that is still the main reason I even pick it up! I love Avon because there is always, without fail a product I like, at an incredibly affordable price. The packaging is so adorable on this perfume, it looks like a little present - almost like it could be a really classy, expensive perfume. Needless to say, this definitely not a high end product! Personally, I'd say it has a really similar scent to YSL Black Opium. A fairly good dupe, for WAY over half the price. The only downfall is that some of the perfumes are seasonal, so you could grow to love one and it will be non existent for ages, then come back 6 months later! This is my most trusted perfume brand. Not only are the apple shaped bottles beautiful, they all smell incredible. DKNY Green Apple was probably one of the first perfumes I ever got and I instantly fell in love. If I want to wear a girly scent, then this is the one I will pick up. It's a happy smell, but also very fruity. If you're not really already familiar with DKNY perfume & you're not a fan of sweet smells, then you will probably this range quite sickly. I have owned pretty much all of them, but this definitely one of the tamer, floral ones. I have loved this brand from as far as I can remember, and I don't think I'll be stopping any time soon! 'La Tentation De Nina' By Nina Ricci Ltd Edition in 2014. 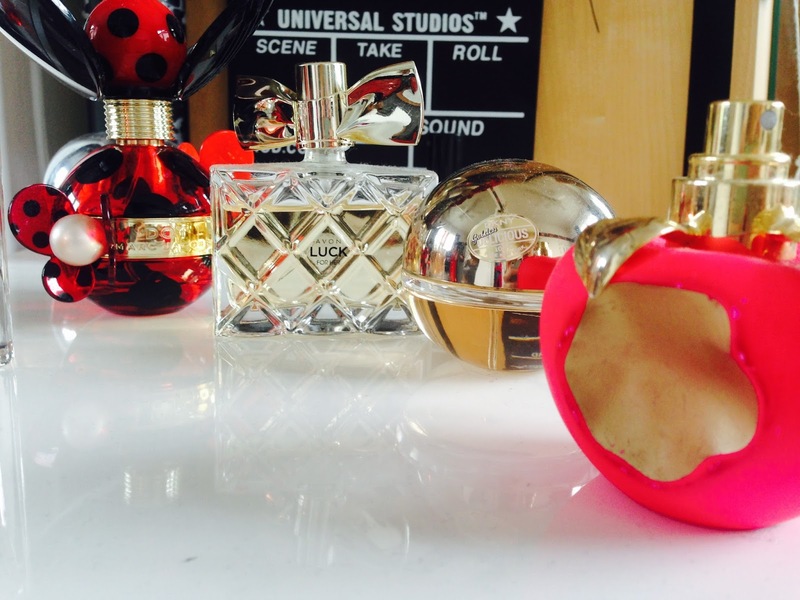 I swear I am just attracted to colourful, apple looking bottle when it comes to perfume. Notice a pattern forming here?! I have no idea where this obsession has sprung from.. I don't even eat apples! This perfume has raspberry, citrus and vanilla tones to it. I really like it when someone throws a bit of vanilla in the mix, that way it doesn't smell as sharp. Although this was limited edition last year, Nina Ricci has actually brought out a pretty much identical bottle. Whether it smells the same I'm not too sure, but I think it's based from the previous scents. I am so excited to give it a smell & see if it's a match! If anyone has smelt it let me know in the comments? I'd love your opinions! Ooooh, the temptation of how I really want this first sentence to go. I'm not even going to say it. I'm guilty of saying it every month! I'm sure you can all relate on the generic intro to a monthly favourites post haha. Anywaaaaaaaayy.. 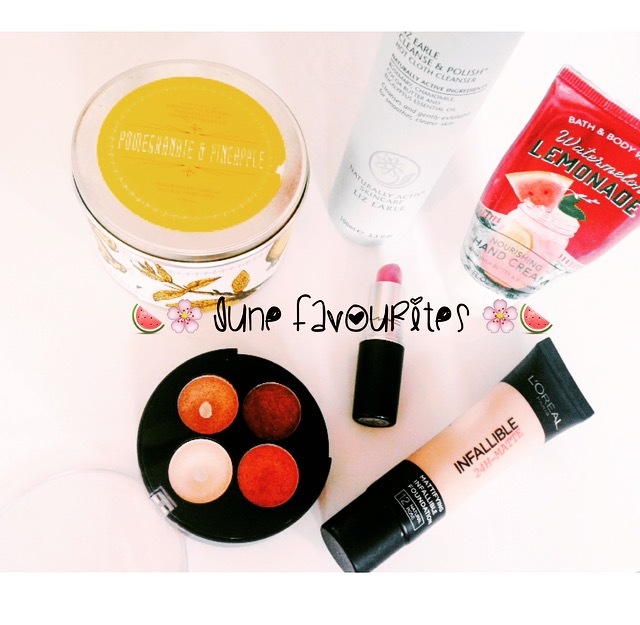 Here are some of my most used products and items I used in June! 1. Pomegranate & Pineapple Fragranced Tin Candle. I have recently rekindled my love for fruity smelling candles, as I have grown to love the more relaxing sort of smells over the last 6 months. But whilst browsing Clintons, this one took my fancy and it smells bloomin' delicious. It is a very sweet, fresh scent and what can only be described as something that would take you away into a holiday dream land! So a few weeks ago, I was just about at my wits end with my skin. The constant change in the British climate means that I have some really bad days where my skin goes haywire, when others when it's not so bad. Having a combination skin type, I suffer with a very oily forehead which is always much worse when I don't actually wear foundation?! I have experimented with loads of different products and skin care routines and nothing seemed to work. I have heard a million and one good reviews on Liz Earle products, and I knew my local Boots had a counter & pay day was fast approaching - as was my meltdown! I was very sceptical about forking out a ton of money on skin care. I always thought it's probably a waste, as they most likely all do the same thing but some just have bigger a label. Turns out, I was wrong. I trusted the good reviews and had a chat with a lovely lady who persuaded me to buy the whole set.. I totally caved! I tried it as soon as I got home, and no joke I saw & felt the difference as soon as I'd used it. It is a cream based cleanser and all of the ingredients are natural, which won't react badly with your skin . It removes any face/eye make-up and wipes off like a dream. The cloth that it comes with shifts any dead skin cells that you may have, leaving your skin radiant with a lovely, natural glow. This product alone stands at £15.50 and it has showed no signs of running out yet, so definitely a great purchase! This hand cream has to be an angel sent from heaven. It smells incredibly amazing and every time I use it, I always get compliments from people saying it smells great! I picked this up because 1. It sounded amazing & 2. Shea Butter is one of the main ingredients, which makes my hands so soft & moisturised. If you are ever lucky enough to go to the US, you absolutely have to visit this shop! Now, I'm not normally a big fan of pink. So as you can imagine, I've had a very love/hate relationship with this lipstick up until recently. I originally purchased it back in the winter, wanting a more daring colour to wear. I would say it's a very Spring/Summer shade, hence why I am reaching for it a lot more now than I did initially. I find it really brightens up my face and compliments the rest of my make-up well. It's a very bubblegum pink shade, which I like as it's so pretty. I find it very hard to tan on my face, so this definitely gives me a bit of colour when I need it most. Being a satin lipstick, it leaves a really nice finish to the lip and isn't as drying as the matte collection. I am definitely going to be more adventurous when it comes to pinky coloured lips from now on! As you can see from the state of the palette, I am obsessed. It's my absolute go-to summer eye look. I love the gold/bronze shades at the moment, and these leave a really lovely shimmer to the lid. They are easily blendable and the pigmentation is pretty good. All of the shades compliment each other so well, no matter how you decide to use them. I also love how compact it is, and it fits perfectly into my make up bag. It's exclusive to Superdrug at a price of only £6.99, so bargain is you ask me! 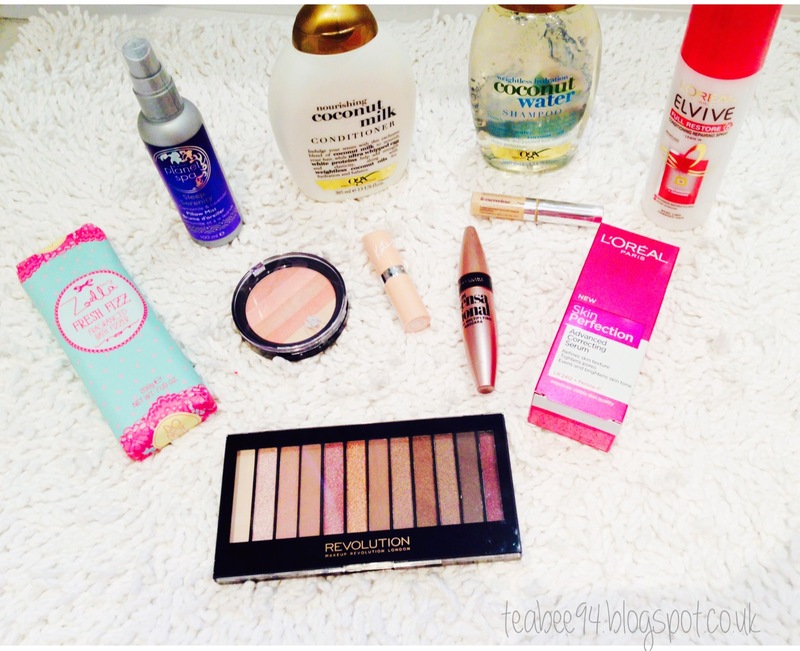 First off, I love L'Oreal products! I previously had the 'True Match Foundation' so once that had rapidly run out, I went searching for a new one. I had seen really good reviews scattered around the blogosphere, and I just could't resist picking it up! I love L'Oreal foundations because I am quite pale, so I know what shades suit me and know they will sit nicely on my skin. The tube looks quite limiting, like you wouldn't get much use out of it, but it's lasted me a good 3 months and counting! It leaves a brilliant coverage, without making your face feel cakey and dewy, which is what ultimately had me sold. There's nothing worse when I feel like my skin can't breathe! It's perfect for my skin type and shows you don't need a big budget for a decent foundation! What were your favourite products in June? Blimey, it's already July! It feels like only yesterday I was going on about how it was June. Oh time, you devious little creation. Anyway, I thought I'd try something I haven't done before. No-one actually tagged me in this, but I saw this floating around the internet whilst on the lookout for tags, so I thought I'd give it a whirl. Eeeek, so despite my URL (it's actually relevant to the first and last initial of my name for those wondering) I don't actually like tea. I think I was born into the wrong country.. The meat and stuffing! I always save those two until the end of the meal, because y'know best until last and all. I love roast potatoes too, depending on who makes them! My least favourite part of a roast are the vegetables.. *voms* I used to love them as a kid but as I've got older, my healthy eating habits are on the decline, where the likes of broccoli makes me gag! The only veg you will see on my plate are the odd few carrots now and again.. Goodbye summer body! Most probably a plain digestive! I know not many people like a soggy biscuit, but for some reason I do. I find it makes the whole hot drink experience more fun! 4. Most Quintessentially British Pastime? Probably just cute walks on the South Downs or having picnics whilst watching sunsets. I'm not very hard to please haha! Wanderlust. I love exploring new places and seeing different parts of the world. The travel bug is following me around like a lost sheep at the moment! Pffft.. I'm absolutely not a cockney, but the only one I know off the top of my head is probably ''Oi oi saveloy''. Random, I know! My Grandad used to say it to me all the time. I never actually knew what it meant until I recently looked it up! For those interested, I've used the definition below from good old Urban Dictionary! It has to be Percy Pigs without a shadow of a doubt! I don't know how I could live without those beautiful pink delights. Definitely my ultimate craving sweet & no.1 stocking filler at Christmas. Chocolate wise, my favourite is probably Dairy Milk Caramel or Toffee Crisp. The Giggling Goose. I have quite a unintentional loud voice at times and I am constantly laughing. So why the heck not?! JK Rowling is a pretty swish human. I know mine and many other childhoods would have been empty without the Harry Potter books/films. Am I right? My favourite restaurant is Miller & Carter - For those who haven't heard of it, it's an amazing steak house! If you are lucky enough to have one nearby, I wouldn't pass up on the opportunity! The meals are just delicious! I have many of favourite shops. Anything that is bath, body or candle related I enjoy very much! Also cute little gift shops, especially ones full of pointless things no-one ever needs in their homes who ultimately end up buying them anyway? Yep, those. 11. What is the first British song that pops into your head? Bohemian Rhapsody by Queen. That song will always be a tune & a great sing-a-long classic! Reminds me of many drunken nights. Hmmm.. I used to love it but now I could definitely go without! 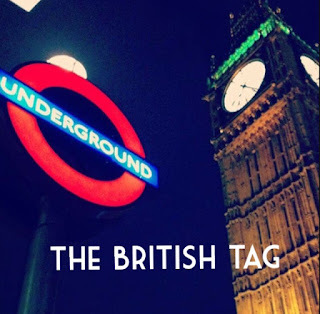 What's your favourite British thing?